All snow globes, both real and virtual, are inherently useless. But Richard Baker’s TUI SnowGlobe isn’t just useless… it’s also strange and kind of funny. Unlike most snowglobes there’s no music to speak of, but there are a total of six oddball “scenes” (plus the obligatory developer promo) to be revealed by shaking your iPhone. My personal favorite? The lucha libre wrestling dog! Give it a try knowing that you’ll probably delete it within five minutes. ¡Feliz Navidad! Snow Globe and eCards aspires to be exactly that: a snow globe that also sends eCards. The snow globe part of the app works well enough even though it looks more like a title screen than a functional part of the app. As for the eCards… ehhhh… it’s pretty average and only works if you don’t use any apostrophes. 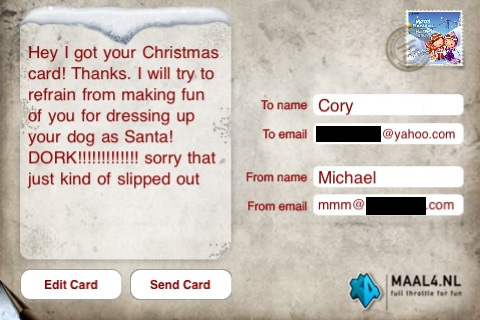 Putting apostrophes in your eCard message will result in a not-so-Christmasy MySQL error, so as long as you keep that in mind you’ll be ok. The eCard itself will send home computer users to the maal4.nl website and anyone who receives it on their iPhone will have to install the app in order to see it. If you really want to send Christmas cards from your iPhone, blow $2 on Christmas C@rds. If you want a snow globe, this app probably won’t impress you. I'll say it again: NO APOSTROPHES! Unless you like getting pissed off. The iXmas Snow Globe is probably the best you’re gonna do in this bunch. 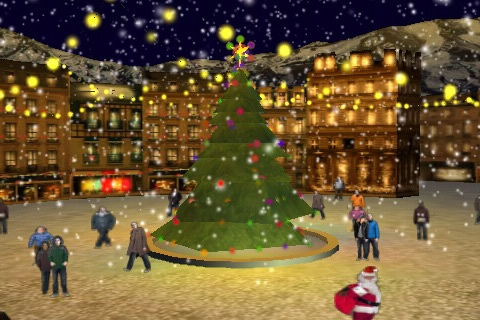 It’s a nice town square Christmas scene, and tilting your iPhone left or right will rotate you around the square’s gigantic Christmas tree. Meanwhile, a nice holiday-sounding piano score mixes with ambient crowd noise and a quick shake will jingle some bells and kick up more snowfall. The Embassy Interactive Inc. did a nice job on this thing so, if you’re just looking to set a Christmasy mood or impress your loser friends who spent money on real snow globes, this should do the trick. Embassy has also released several versions of their Tangram puzzle app and the Christmas apps iXmas Tree and Holiday Mistletoe. 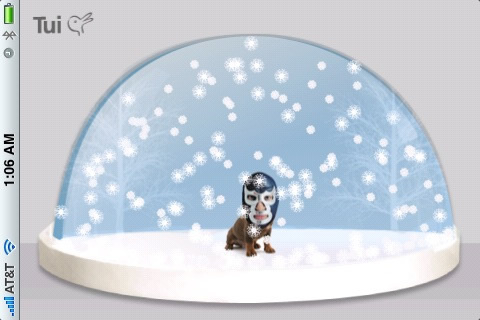 I don’t know, I kinda like the TUI Snowglobe… it’s kind of … twisted, but then again, so is my humor. I wonder if there’s a hidden message in the crossbreeding of the various scenes. Why no review of “3D Snowglobe”?